Food hall and café Fodder, Yorkshire Event Centre, Harrogate Caravan Park and the Great Yorkshire Show have been shortlisted for the awards. Based on the showground in Harrogate, all are owned by the Yorkshire Agricultural Society and all of their profits go back into the Society’s charitable work. The 159th Great Yorkshire Show from Tuesday 11 to Thursday 13 July, attracts over 130,000 visitors across three days and has been shortlisted in the Yorkshire Event category. 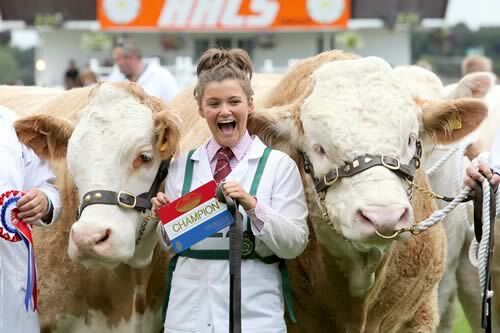 Now recognised as England’s premiere agricultural event, the show will see thousands of top class animals compete for much-coveted silverware. There will be cooking demos, stunts and displays, a celebrity fashion show, farming seminars and much more. The Yorkshire Agricultural Society is funded by the profits made from Fodder, Yorkshire Event Centre and Harrogate Caravan Park which are all overseen by Managing Director Heather Parry. Shortlisted in a Taste of Yorkshire category, Fodder is the only café food hall of its kind in the UK where 100% of profits go back to an agricultural charity. It supports over 350 local farmers and producers and 85% of what’s stocked and served is produced in Yorkshire. All food good enough to eat but not sell, is donated to the Harrogate Homeless Project. A path has recently been built joining Fodder to the Harrogate Caravan Park allowing easy access for holidaymakers. The caravan site was renovated and opened in 2014, with 67 pitches for caravans, motorhomes and tents. It is now open for eight months of the year (from March 6 – November 5) and has recently taken its 10,000th booking. It has seen a 30% growth in bookings and has been shortlisted in the Yorkshire Holiday Parks category. Yorkshire Event Centre has had the most recent investment after undergoing an £11 million rebuild last year. It is now the largest event space of its kind in the North East and has been shortlisted in the Business Tourism category. Not only does it hold award ceremonies, conferences and exhibitions, the YEC has won a string of awards in its first year since the rebuild including being named the “most modern, inspiring and dynamic event space in the region” at the 2017 RICS Awards ceremony held in Leeds. The White Rose Awards are the biggest tourism event of its kind in the UK and are organised by Welcome to Yorkshire.